Customers Ask Honest-1: In next couple months there are so many things to do and see, the last thing I want is an unexpected breakdown while headed to our holiday events. What can I do now to make sure my car is ready when I need it? Inspecting your car on a regular basis is important, but becomes even more important before venturing out on a much needed errand, a longer trip around town or even out of town visiting family and friends. Take time to stop and take a 10 minute inspection of your car before heading out. Check all fluids. There are several fluids in your car that require attention: engine oil level, power steering, brake and transmission fluids, windshield washer solvent and coolant. Remember your car should always be on a level service when checking fluids and your car should ALWAYS BE COOL! For help and pictures on how to correctly check the fluids in your car, go to https://www.wikihow.com/Check-the-Fluids-in-a-Car . Check your tires. First, open the driver door and look for the sticker on the inside part of the car. This sticker will show you proper inflation levels. Make sure your car tires are inflated properly by using a tire gauge. Under or over inflated tires can cause a host pf problems including everything from decreased efficiency in gas mileage to an increase in the probability of a blowout. Second, take time to check for bulges, marks and the tread of your tires. The old penny test is a great one for this. If you can see the top of Lincoln’s head, it is time to change your tires. Check your Wipers:Although Phoenix has not seen a good rain shower for a while, you need to always be prepared when the weather turns. Make sure your wipers are in good condition. Test them by spraying windshield fluid from your wipers and check for streaks on the windshield. Also visually inspect them for cracks and breaks. Excessive heat causes rubber to break down faster, so if you have not change your wipers in the past year, it is time! Check hoses and belts.A belt that fails can affect the electrical system, air conditioning and power steering, as well as the cooling system, which keeps your engine from overheating. Look for visible cracks, breaks or stripping. Cooling system hoses may be deteriorating from within, so old hoses and clamps in marginal condition might need to be replaced. Finally, if you notice anything, make an appointment with Honest-1.We will continue that safety inspection free of charge and let you know if your car is in need of any preventive maintenance services or if there is anything we can do right then that will prevent the chances of breakdowns. Our Honest-1 professionals are happy to give you peace of mind and a head start on those holiday events. Catching problems early and performing needed maintenance services or repairs now, can help prevent even more costly repairs in the future and give you the satisfaction of knowing you are prepared! Make your appointment today! 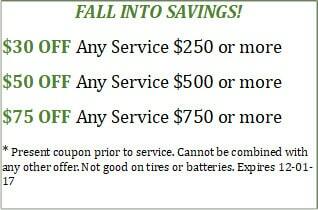 Use this coupon for even MORE Fall Savings! "Located near JC Penny at PV Mall, next to Dutch Brothers Coffee, across the street from Target and REI"